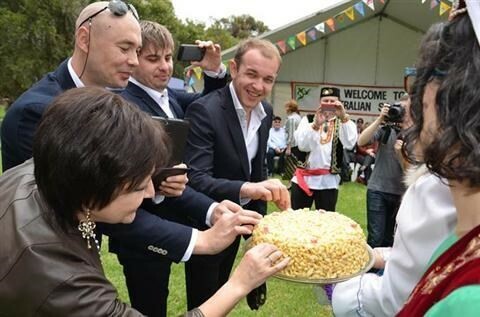 The Tatar community in Adelaide, South Australia celebrated the Sabantui at the Stockade Botanical Park on the 16th December 2012. Special guests and government officials were invited to this gathering. The Ministry of Culture of the Republic of Tatarstan sent well-known and talented singers from Tatarstan, folk singer of the Republic of Tatarstan Ms. Venera Ganeeva and Honorary singers of the Republic of Tatarstan trio Kazan Yegetlere (Marat, Artur and Aidar), to Adelaide to take part in Sabantui celebrations.